We have exciting news to share! Many of our members have asked if they can donate their Honey Gold to charities of their choice. We listened to your feedback, and now you can. 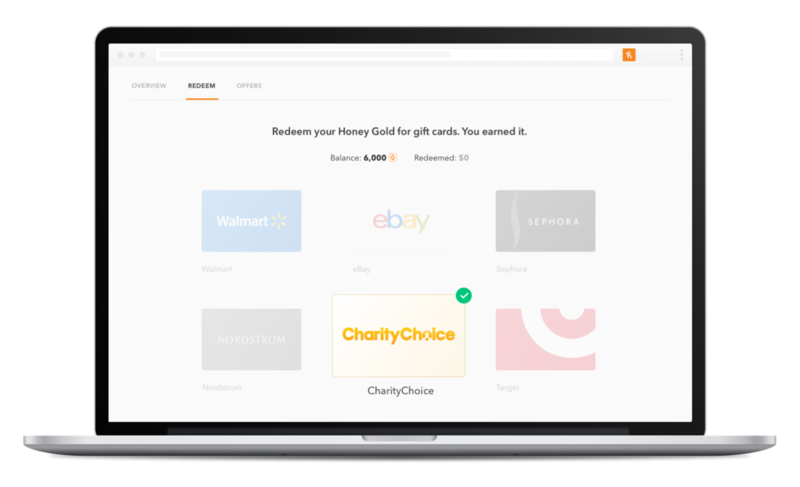 When you shop at any of our 3,700+ participating sites, you’ll earn a percentage back in Honey Gold. When you’ve earned 1,000 Gold or more, you can now redeem your Honey Gold for a CharityChoice gift card. With over 1,000 charities to choose from, you can make a 100% tax deductible donation that you feel great about. Popular organizations you can contribute to include the American Cancer Society, St. Jude Children's Research Hospital, American Red Cross, ASPCA, Alzheimer's Association, and more. Once you’ve accumulated 1,000 Honey Gold, you’re ready to redeem! Select CharityChoice, then click Redeem. We’ll email you a redemption code from CharityChoice. You can redeem it then, save it for later, or gift it to a loved one to redeem. Still working on racking up enough Honey Gold? Check out today's top deals and stores on your Honey newsfeed.